The Glass House, built in 1949 by famed architect Philip Johnson, is one of the nation’s greatest modern architectural landmarks. Inspired by Mies van der Rohe's Farnsworth House, the Glass House’s exterior walls are made of glass with no interior walls, a radical departure from houses of the time. The pastoral 49-acre landscape comprises fourteen structures, including the Glass House (1949), and features a permanent collection of renowned 20th century painting and sculpture, along with temporary exhibitions. 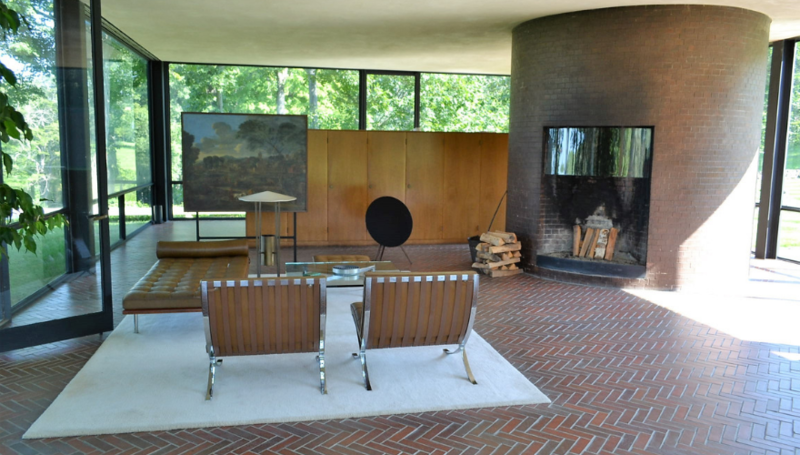 Philip Johnson was a singular tastemaker, influencing architecture, art, and design during the second-half of the twentieth century. The Glass House was a remarkable achievement when it was completed. Invisible from the road, the house sits on a promontory overlooking a pond with views towards the woods beyond. The house, which ushered the International Style into residential American architecture, is iconic because of its innovative use of materials and its seamless integration into the landscape. 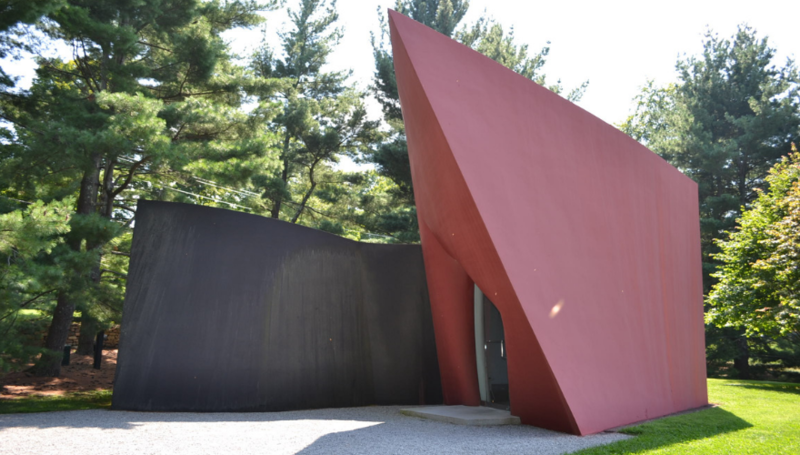 It began an odyssey of architectural experimentation in forms, materials, and ideas through the addition of many new "pavilions" -- Guest House, Lake Pavilion, Painting Gallery, Sculpture Gallery, Ghost House, Studio, and Visitors Pavilion -- and the methodical sculpting of the surrounding landscape. Today, the campus is an example of the successful preservation and interpretation of modern architecture, landscape, and art. Philip Johnson's Glass House is an estate of 16 buildings, structures, and objects situated on 40 acres of land in New Canaan, Connecticut. Located on the western side of Ponus Ridge Road and screened from view by a high stone wall and trees, the property consists mostly of open fields, stone walls, and scattered clusters of trees; from the road along the idge, the land gently slopes downward toward a bluff, where it then descends much more steeply to a small pond and wooded area on the western edge on the property. The centerpiece of the estate is the Glass House and its associated brick Guest House, both built in 1949 to serve as Johnson's weekend residence. Sited on the edge of the bluff, the Glass House is a simple rectangular prism, 32 feet by 56 feet in plan, with a height of 10.5 feet. The house's walls consist entirely of 18-feet-wide floor-to-ceiling plate-glass sheets secured between black-painted steel piers. Stock H-beams anchored the glass with angle brackets. An off-center cylindrical mass of brick, which has a fireplace on one side and the entrance to the bathroom inside the cylinder on the other, protrudes through the top of the flat roof. The foundation is a brick platform with a slab for frost footing. Like the floor of the house, which is laid in a herringbone pattern, the cylinder is constructed of glazed brick in various shades of deep reds and browns with lighter-colored flecks. Otherwise, the interior is completely open, with low cabinets and bookshelves serving as area dividers. The other major division in the living area, aside from the brick cylinder, is the long line of 42" high cabinets which contains the kitchen. Two panels on top of this unit, when opened and folded back, provide a black linoleum work surface. The sink, two refrigerators, a stove, and storage are all included in the one unit, besides a liquor closet which opens into the living area. With ventilation from all four sides the whole house is one room cooking odors disappear almost immediately. Six spotlights above provide light, and a rubber mat on the floor behind the counter simplifies the mopping-up activities. 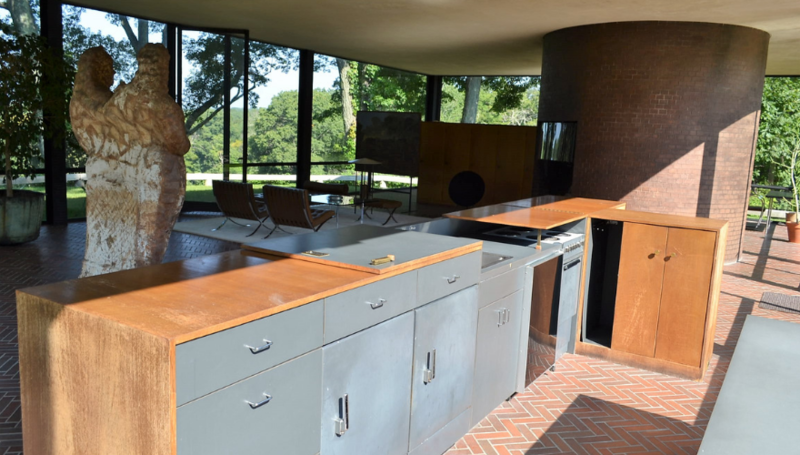 The furnishings have been largely unaltered from the house's original construction and include chairs and tables made from designs by Mies van der Rohe. The area immediately surrounding the Glass House is treated as lawn, with crushed stone paths connecting the Glass House with its brick companion, the guest house, and a low light-gray granite curb demarcating the outer edge of the lawn. Similar granite forms the low steps to the Glass House's entrance, which is a full-height single-pane glass door centered on the east elevation. Tours of the Glass House are available in May through November and include self guided tours and expanded educational opportunities for local communities. The Glass House is owned and operated by the National Trust for Historic Preservation.